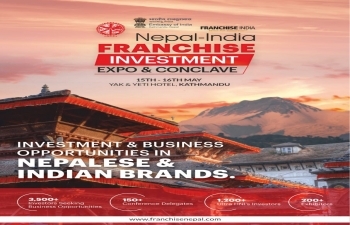 Embassy of India in Kathmandu in association with Federation of Nepalese Chamber of Commerce & Industry (FNCCI) and M/s Franchise India are organizing Nepal-India Franchise Investment Expo and Conclave on 15-16 May 2019 at Hotel Yak & Yeti, Kathmandu. Nepali economy is increasingly being fueled by highly aspiring Nepali consumers who expect nothing short of world’s best when it comes to their brand consumption. It is important for businesses in Nepal to cater to this aspiring target segment of consumers and Conclaves of this nature will help in bringing the leading Indian iconic brands to Nepal. Their entry into Nepal would not only bring investment into Nepal but also technology transfers and business knowhow. It is expected around 70-80 iconic and leading brands of India would be participating in this Conclave to seek business partners from Nepal. Initial confirmation has already been received from some flagship brands in the area of retail, fashion, education, hospitality and food and beverages, among others.